In a sushi-loving city like Vancouver, it's hard to stand out as a Japanese restaurant. There are hundreds of sushi eateries in Metro Vancouver so when I heard that Kanpai Japanese Bistro was opening for the sake crowd, I was a little more excited than usual. Coming from the same business that pushed a lobster-first menu, I got to experience Kanpai Japanese Bistro for myself last week. The sake game was stronger here than the average sushi restaurant. On the menu was both a house sake as well as options with the rice milled down to 23%. For the prices of the food, this seemed like an appropriate range of sake. 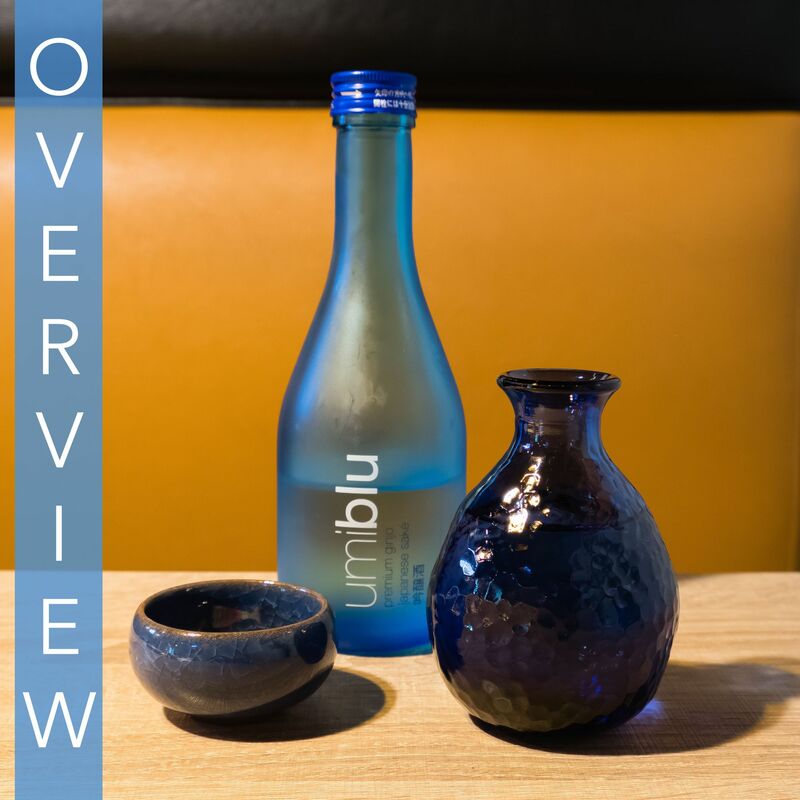 Our Umi Blue Ginjo (tropical fruit flavours finishing in a smooth acidity) came served in a blue serving glass and the Senkin Classic Omachi Junmai Daiginjo (sour plum acidity with peachlike finish) in a classic clear serving glass. For my palate, I liked the smoother finish of the Umi. The Senkin just felt like a sharp sensation due to the sour zing. Moving onto food, we had ourselves 4 small plates which start at $16 for a set of 4. First up was the nori avo dip. With equal parts seaweed sauce and house-made guacamole, dashed with a bit of onion this was a pretty fantastic dip. The chips were pretty cookie-cutter but I could imagine myself snacking pretty hard on this dip if it were readily available as a larger plate. The spicy tuna came next. This was a soy saucy plate of tuna dotted with rice and laced with serrano chili. The tuna was juicy (up to regular Vancouver sushi standards) and this left a soft heat on my mouth. Nothing compared to what came next though. The aptly-named stupidly spicy wings were both a treat and a curse. The sweet honey sauce on these deceptively hid a bubbling layer of heat within. Inside was a pretty juicy whole wing that would be great with a mild rub. I admit I have a low spice tolerance but I would not be able to finish a whole plate of these by myself. If remember me at the "Alitas de Pollo" from Poquitos Cantina, it's a similar ending here. I didn't cry this time, but if I ate a second wing, I probably would have. Our last small plate was the beef tenderloin. It costs a dollar more, but this was also more exotic, being a sous-vide medium-rare tenderloin cooked with a black pepper crust. Now, our tenderloin didn't really show much of a black pepper crust (see below), but this was a very juicy tenderloin. Starting with the juicy beef and finishing with the sharp onion was the right way to enjoy this tenderloin. On the sushi side of things, we enjoyed the saba oshisushi (box sushi). Despite the menu stating 6-piece servings, ours came with 8 pieces. Each oshisushi piece was a constructed and pressed combination of rice, saba, and ginger. While each piece had a generous serving of saba draped over each box of rice, the ginger within was a little more inconsistent with smaller and larger pieces discovered in each oshisushi. The rice was a nice room temperature though, so none of that mass-produced-and-chilled sushi rice nonsense here. The most interesting dish on the menu (in my opinion) has to be the lobster pizza. This restaurant went through a whole rebranding but luckily this pizza still has a home on the menu. Limited to just 3 orders a day, the lobster pizza is kind of exclusive. This is no mashed lobster either. It literally is a lobster (claws and tail included) on a white mushroom pizza. On exclusivity alone, I don't know anywhere else in Vancouver you could find this. The pizza, while a cool concept, is really just for those who need lobster on their pizza. I wish the cheese had more zing and more of a fresh taste. If you've ever had shredded cheese from a grocery store and noticed the cellulose-y sawdust layer that keeps the cheese from sticking, you'll notice it in this pizza too. You get what you pay for though and you can rest assured most of the $45 you're paying goes towards the whole lobster. "Kanpai" (かんぱい) is a Japanese phrase for "Cheers! ", often said while enjoying sake in a group. With that in mind, it's easy to see Kanpai Japanese Bistro plans to differentiate itself from the other Japanese sushi shops in the neighbourhood through its sake and small plates menu. The restaurant replaces the Kadoya Japanese Restaurant that used to be here and adorns lobster accents in a few places to renew the interior. There is seating for about 60 guests in booths and dining tables. For those interested in restroom facts, the restroom here is actually shared by a few restaurants in the same building. It's a bit of a trek around two corners to get there so maybe give yourself extra time to find your way there. Would I go back? Yes for a sake-tapas kind of night.